King George II came to the throne in 1727, and the form of the Royal Cypher was again changed. Bills for 1729 record the cost of embroidering the new of Standard as £28, and also mention 'numbers of distinction’ (that is, Company numerals) on the Captains' colours, but, as we have said, it is improbable that their use had ever been discontinued. In 1736, the cost of embroidering the Standard had risen to £30, and it was the same in 1744.
its cords and tassels are gold and crimson. The remaining colours are in the form of the Union flag, and have crimson cords- and tassels. The Lieutenant-Colonel's it and the Major's colours display the Crown and the Royal Cypher 'GR' Reversed and Interlaced, the latter with a gold flame in the canton. The Captains' colours bear the twenty-four Company badges, all, including the Royal Crest (No 1 Company), ensigned with the Crown. Each colour has the Company numeral in as gold roman figures in the canton. The 1747 Infantry Colour Book directs that, in the Marching Regiments, 'The Length of the Pike and the Colour itself to be of the same size as those of The Royal Regiments of Foot Guards'. Although the text does not give the measurements, one of the accompanying plates records this information. The pike, from the tip of the spearhead to the bottom of the ferrule, was nine feet and ten inches in length, the spearhead itself being four inches in length. The cords and tassels hung to the length of three feet, of which the tassels took four inches. The flag was six feet and six inches in the fly and six feet and two inches in the is hoist, exclusive of the sleeve. The next septennial issue of colours was in 1751, and the bills do not indicate any changes. In private possession, there are the two oldest surviving colours of the 1st Foot Guards that we have found, a Standard and a No 3 Company colour. September 1758, and the family tradition is that they came down from him. There was another issue of colours in 1756 or 1757, so, if the tradition is correct, it is likely that the two surviving belonged to the 1751 issue. The General had a son, also Alexander, who joined the Regiment as an Ensign in 1775, was eventually promoted Captain and Lieutenant-Colonel, that is, a Company Commander, in 1 789, and retired in 1794. We mention this because, as we shall see, the drawing of the Royal Cypher on the Standard could equally well date from the reign of King George III. On the other hand, it seems to us that, on balance, it is more likely that a worn-out King's Company colour would have passed into the possession of the Lieutenant-Colonel than into that of a Company Commander who, the Regimental records shew, had never had The King's Company. The Standard is of crimson taffeta, made up in three horizontal strips, but, unfortunately, about eight inches of the fly, together with two of the corner badges, are missing. The Crown and the Royal Cypher 'GR' Reversed and Interlaced and the other two National badges are embroidered in gold and silver passing thread, flat upon the material. The Captain's colour is painted, and the Crown is drawn in the usual manner, except that an attempt has been made to shew the fourth (rear) arch. The drawings of the Crowns and of the Royal Cypher on this Standard are very different from those in the 1746 Colour Book. On the other hand, they resemble closely those in a work that we shall study later, the 1793 Books, which are alleged to be based upon information dated 1758. As we mentioned when studying the standards of the Household Cavalry, it is not always possible to be certain, without external evidence, to which King George a given drawing of the Royal Cypher Reversed and Interlaced relates. In 1756, the 1st Foot Guards adopted crimson colours for all the Field Officers. The Lieutenant-Colonel and the Major were distinguished by a Union flag in the canton, the latter having also a gold flame springing from the medial corner of the canton. The central devices were unchanged. The Captains continued to carry Union colours, which were the same as before. 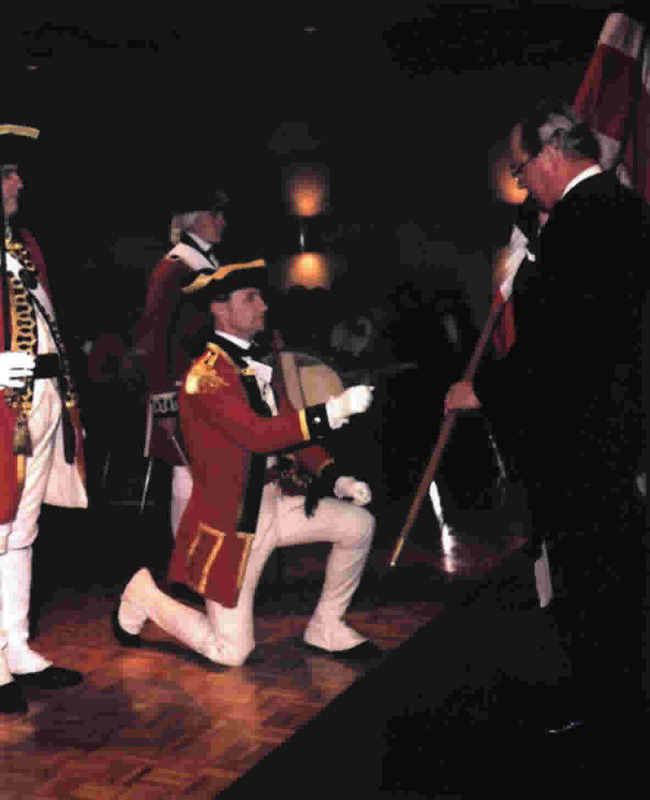 Lt. Szkolka receives the Regimental Colours from Brigadier DH Blundell-Hollinghead-Blundell, the President of the Grenadier Guards Association, London at the 25th Anniversary Dinner Dance of the North American Branch Grenadier Guards Association in London, Ontario in October 1997. The custom of Trooping the Colour dates back to the 1600s when the colors of a regiment were used as a rallying point in battle and were therefore trooped in front of the soldiers every day to make sure that every man could recognize those of his own regiment. The Foot Guards did this in London from 1755 onwards as part of their daily Guard Mounting on Horse Guards and the ceremonial of the present parade is similar. In 1805 the parade was for the first time carried out to celebrate the Sovereign's birthday. This impressive display of pageantry is now held on the occasion of the Queen's Official Birthday each June. It is carried out by her personal troops, the Household Division, on Horse Guards Parade, with the Queen herself attending and taking the salute. Since 1987, The Queen has attended in a carriage rather than riding, which had done on 36 occasions, riding sidesaddle and wearing the uniform of the regiment whose color was being trooped. The regiments take their turn in rotation for this honor. Over 1400 officers and men are on parade, together with two hundred horses; over four hundred musicians from ten bands and corps of drums march and play as one. The parade route proceeds from Buckingham Palace along The Mall to Horseguards Parade, Whitehall and back again. Precisely as the clock on the Horse Guards Building strikes eleven, the Royal Procession arrives and The Queen takes the Royal Salute. The parade begins with the Inspection, The Queen driving slowly down the ranks of all eight Guards and then past the Household Cavalry. THE time-honoured badges and other devices borne by our British Regiments can boast in many instances of a very interesting origin. This is not only true with regard to the 'white horse,' 'laurel wreath,' or 'castle and key,' which we are accustomed to see set down in almanacs and the like as the badges of certain corps, for there are frequently other distinguishing features that find no place in such lists. These are sometimes of a kind, too, not well calculated to attract the notice of non-military persons; and it is possibly within the mark to say that not one in twenty civilian observers detects, for example, the apparently meaningless bow of ribbon on the back of the collars of the Royal Welsh Fusiliers. This much-prized decoration is a unique distinction, without, however, any very heroic history; it is merely a memento of the queue or pigtail which was worn in the army till about 1808. Among other badges, the same regiment carries the not unusual one of the 'white horse,' above alluded to. Though well enough known, no doubt, to be the 'white horse of Hanover,' it is probably not so widely understood for what reason this device came to be bestowed upon so many of our older regiments. It would appear that in the beginning of the last century the appointments of a good many corps displayed the armorial coat or crest of the colonel-in-chief, who was often a member of the aristocracy, and a territorial magnate in some part of the country. Such marks of distinction on the part of these territorial families, we are told, excited the keen jealousy of the newly-arrived Hanoverians, so much so, that one of the very first steps taken by George I. was to sweep away these family insignia and replace them with his own. Hence, the frequency of the white horse as a regimental device. A regiment of great renown, the Scots Greys, carry as a badge an eagle with outstretched wings - the only device of the kind in the army. The Greys have enjoyed this unique distinction since the celebrated capture of a French eagle or standard at Waterloo by Sergeant Ewart, who was given a commission for his gallantry. It is a well-earned badge, too, for the Greys have a sort of pre-eminence for taking standards: at Ramillies they captured the colours of the 'Régiment du Roi;' while at Dettingen they took the famous white standard of the French household cavalry. And they are well entitled to the motto 'Second to none,' which they proudly carry. The mention of this motto reminds us that there is another of the kind, though in Latin, in the 'Service:' the Coldstream Guards carry the words 'Nulli Secundus' upon their regimental colour. When the troops were paraded to take the oath of allegiance to Charles II. after the Restoration, the men were ordered to 'ground' their arms. Among others present were the three regiments since known as the Foot-guards; and they were commanded to take up arms as the First, Second, and Third Guards. The First and Third obeyed with alacrity; the regiment of General Monk stood still, to the surprise of the king, who inquired of Monk the reason for their insubordinate bearing. The veteran replied that his regiment declined to be considered second to any other; and, says the legend, Charles remarked 'Very well; they shall be my Coldstream Regiment of Foot-guards, and second to none.' Hence the motto. General Monk's connection with this corps is commemorated in a curious manner. 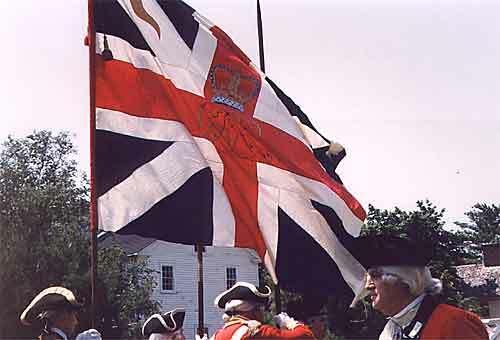 A small Union Jack is borne on the Queen's Colour of the Coldstream, in consequence of Monk having been an Admiral of the fleet as well as a general. This is a distinction without a parallel in the army. Almost every one must notice that while officers wear their sashes over the left shoulder, sergeants have theirs over the right. There is one exception, however, to this rule; for the sergeants of the 29th Foot arrange their sashes in precisely the same manner as the officers. Some say that this distinction dates from Culloden, where the regiment is alleged to have had so many officers slain, that sergeants had to take their places in command of the companies. Another regiment, the 13th, commemorates its terrible loss on the same field in a different fashion: the officers wear perennial mourning in the shape of a black stripe in their gold lace. This kind of perpetual mourning is not, however, peculiar to the 13th. The 65th and 84th have black-edged lace on the officers' tunics, in memory, it is said, of the loss they sustained on the Nive in 1813; and black gloves used to be worn by the 84th to commemorate the same event. Some other corps have the black stripe in their gold lace, but it seems to be very doubtful for what reasons. In certain cases it is supposed to be a symbol of mourning for General Wolfe or Sir John Moore; in others, for heavy losses in action. At Dettingen, in 1743, the 22d Foot extricated George II from a somewhat perilous position, in remembrance of which event they wear a small sprig of oak in their caps on the Queen's birthday and other special occasions; and on the 29th of May an acorn is worn by some old regiments, that date being the anniversary of the Restoration. In a similar fashion the 12th and 20th wear a rose on the 1st of August. This floral decoration arises from the tradition, which is well founded, that at Minden these regiments marched through flower-gardens, and most of the men wore roses as they went into action on August 1, 1759. For their prowess at Minden, the 12th, 20th, 23d, 25th, 37th, and 51st regiments were granted leave to carry a laurel wreath on their colours and equipments; and for reasons above alluded to, the 20th have in addition a rose on their standards. Besides the 'Minden wreath,' there is one other instance of the same symbol in the army - it is borne on the colours of the 57th, the 'Die Hards' of Albuera celebrity. A regiment just mentioned, the 12th, together with the 39th, 56th, and 58th, carry the 'Castle and Key,' the motto 'Montis insignia Calpe,' and the word 'Gibraltar,' on account of having taken part in the memorable defence of that fortress from 1779 to 1783. A famous regiment, the 5th or Northumberland Fusiliers, has a distinction of a curious if not altogether unprecedented variety. In their head-dress the officers and men have a plume red in the upper moiety and white in the lower; and though this may not perhaps seem a matter of much moment, it has a history. At Wilhelmstahl, and again when in St Lucia, the 5th, after sanguinary combats, gathered from the caps of slain French grenadiers enough white feathers to fit out the whole regiment with plumes - an adornment which a while afterwards met with the approval of the authorities. But in 1829 a War Office order gave instructions for the white plume to be more generally adopted in the service; and in consequence of this innovation, the Fusiliers complained that they would lose their well-earned distinction. So the matter at issue was eventually compromised by granting them permission to wear the half-red, half-white plume above mentioned. For reasons never properly explained, the 5th wear a rose on St George's Day. Besides feathers, other curious trophies are represented in the belongings of this regiment. At Lucknow they captured an ivory bedstead belonging to the Begum, as well as a great rod or stick of silver. From a part of the former a bandmaster's baton was carved; while the latter was fashioned into a drum-major's staff. Both are still doing duty. This staff, by the way, reminds us of the ivory stick carried on the anniversaries of certain battles by the sergeant-major of the 91st Highlanders. When on the way home from the Cape in 1802, the transport having the regiment on board was charged by a sword-fish, which left its weapon embedded in the side of the vessel. Converted into a walking-stick, the ivory sword accompanied the sergeant-major through the whole of the Peninsular War. The names of the battles in which it was carried are inscribed upon it on plates of solid gold; and it is still carried on parade by the sergeant-major on the anniversaries of these actions. Somewhat akin to the party-coloured plume of the Northumberland Fusiliers, again, was the red ball which used to appear on the shakoes of the light company of the 46th Foot. During the battle of Brandywine, in the American War, this company by accurate shooting made great havoc in the ranks of the enemy, who threatened, when they could obtain a favourable opportunity for revenge, to give the marksmen no quarter. In defiance, however, of this menace, and to make themselves more readily distinguished from their comrades, they dyed the ball in their caps red-with blood, according to tradition - in place of the green worn by the rest of the regiment. This distinction was subsequently sanctioned by the War Office authorities. One more instance of a similar kind, and we are done. The 28th Foot used to have a singular distinguishing feature in their number badge, which was affixed not only on the front, in the usual manner, but also on the back of their caps. On one occasion in Egypt, when rather incautiously drawn up in line, a fierce onslaught was made upon the regiment, in rear as well as in front, by large bodies of French cavalry. Theft was no time to get into square formation to 'receive' the charging horsemen; but the commanding officer, being a man of resource, shouted, 'Rear rank, right-about-face. Fire!' The men carried out the order with promptitude; standing back to back, they simultaneously beat off both assaults; and to commemorate the affair, they were granted the unique distinction of the duplicate number badge.